A maiden commercial flight between New Delhi and Tel Aviv flew over Saudi airspace on Thursday evening, marking a historic shift in diplomacy between Israel and Saudi Arabia. AirIndia flight 139 flew over Saudi Arabia for approximately three hours, coming within 37 miles (60 kilometers) of the capital city Riyadh. Israel and Saudi Arabia have no diplomatic relations, although there have been major signs of warming ties. Currently, Israel and Saudi Arabia have no diplomatic relations, although signs of warming ties between the Middle East powers have become frequent. This most recent move has ended a 70-year ban on planes marked for Israel flying over Saudi Arabian airspace. AirIndia’s Boeing 787 Dreamliner left New Delhi at 6 p.m. local time, and flew over Saudi Arabia for approximately three hours, coming within 37 miles (60 kilometers) of Riyadh, Reuters reported. AirIndia flight 139 landed in Israel’s Ben Gurion Airport shortly after 10 p.m., according to Flightview tracker. The 7 1/2 hour flight also flew over Oman, which also does not recognise Israel. Officials from Oman have yet to comment on the news. Saudi Arabia has previously denied reports of the historic flight agreement. 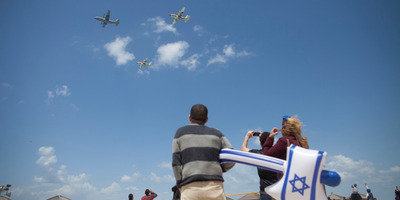 Yariv Levin, Israel’s tourism minister, and his ministry’s director general, Amir Halevy, were reportedly at Ben Gurion Airport to celebrate the inaugural flight. “This is a really historic day that follows two years of very, very intensive work,” Levin said in a radio interview. Israeli media reported AirIndia will receive a one-time grant of 3.2 million shekels ($US925,000) from the Tourism Ministry to operate the route, which is expected to increase to three times per week. It is unknown why AirIndia is being paid to fly the route. But Riyadh has not granted any Israeli airlines the right to use its airspace, although Israel’s flagship carrier, which has a direct route from Tel Aviv to Mumbai, has requested access. Reports indicate that Saudi Arabia and Israel have recently bonded over interest in the creeping regional influence of their mutual enemy Iran. While the two countries have been coy about reports of exchanging intelligence, Israel has been upfront about its “covert” contacts with Saudi officials. In 2017, a leaked diplomatic cable confirmed longtime rumours of Israel and Saudi cooperation. In the cable, Israel instructed its overseas embassies to encourage support for Saudi Arabia in its battle against Iranian-proxy Hezbollah.